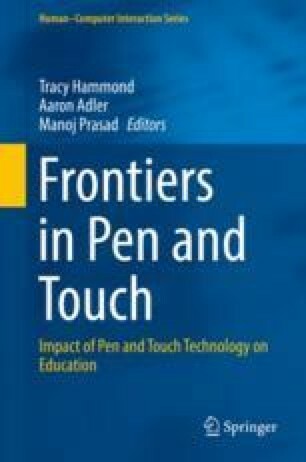 This essay highlights a rationale for pen and touch in K16 mathematics classrooms, arguing that digitizing mathematical cognition can promote learner flow. The personal computing and mobile technologies that have transformed society since the 1980s left a large element of mathematics learning, which relies on non-keyboard symbol systems and drawing, untouched in comparison to learning in disciplines that involve construction and manipulation of written text that can be expressed with a keyboard. Yet over the past decade pen and touch has gradually brought into the digital era that large fraction of K16 mathematics that relies on symbol and visual systems that exceed the representational capacity of the standard keyboard. It has become a portal for research in new forms of research and new forms of mathematical learning. The paper argues that learner flow can be promoted through pen and touch and identifies a three-tier initial taxonomy for classifying such applications. The author acknowledges the generous support of the US National Science Foundation, the US State Department, the US Department of Education, Microsoft Research, and Pepperdine University in the research reported here, which reflects the views only of the author.